This is the first year that we have had handbells in our district. 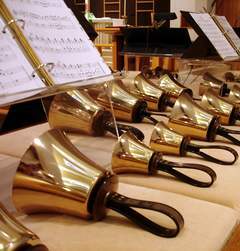 The PV Ringers will delight you with our handbell music. Our first performance will take place on September 30, 2016. Come see and hear us ring! Handbells can fulfill several important functions: development of individuals’ musical skills, encouragement of teamwork, socialization and self-esteem, and expansion of the music program. Teachers can readily address rhythm, dynamics, key signatures, and notation in a group setting with handbells, and over time teach everything from duration and loudness to timbre, texture, and style. Handbells also teach individuals the importance of group cooperation and team spirit, an important concept in any ensemble program. The very nature of a handbell choir requires individuals to work together if their instruments are to make music. Participation in a handbell program can also help build confidence and self-esteem for those who have difficulty finding achievement elsewhere. Since handbells are easy to play, success can come quickly--even to those not particularly gifted, either musically, artistically, or academically. What’s more, it can provide the pleasures and commitment of a musical ensemble experience to students who have not invested years in learning more traditional band and orchestra instruments. Perhaps most important, the flexibility and growth inherent in a handbell program lets students begin at the beginning and progress as far as they might desire. Handbells can also fulfill at least two important objectives: the educational objective of challenging individuals with a limitless range of ever more demanding arrangements, and the performance objective of presenting magnificent music to public audiences. As such, a performing choir can help any institution establish and maintain a visible presence in its community--not just by staging concerts within the facility itself, but by reaching out to those in nursing homes, hospitals, shopping malls and other public venues.